Join us as we seek new opportunities for spiritual growth. Our popular Bible Study, Adult Forums, and classes/group discussions provide us with opportunities to continually learn and grow as disciples of Jesus. To learn more about scheduled forums and events, check our calendar. Was Eve a good girl or a bad girl? Questions like this about Eve, Sarah, Hagar, Bathsheba, and many other women in the Old Testament will be the subject of 2018-2019 Wednesday Bible Study. Given contemporary understanding of the role of women, how might we interpret the lives of these women in relevant, meaningful ways? Together, we will examine the individual choices made by these women as well as the larger context in which their actions were a part, looking at their behaviors in relation to the culture of their time. Additionally we will focus on the Jewish perspective in which these stories were originally written and the Christian interpretation of them since the time of Jesus. This theme will provide a wide exposure to many books of the Old Testament, so is a good way to increase your familiarity with them. The companion text for this class is “Good Girls, Bad Girls” by T.J. Wray. Copies are available in the Church office. The Scripture Study Fund covers the cost of the books, so they are free to those participating. Please sign up for the class when you pick up your copy. Morning class meets September 19, 2018- May 22, 2019 from 10-12 noon; evening class from 7-8:30 PM. This is not a lecture format, but a discussion based opportunity led by Tracy Rubin, MTS, Harvard Divinity School. Any degree of participation is welcome. Please join us for this exciting year of communal study and sharing that aims to deepen our faith through mindful attention to scripture. Everything you always wanted to know about Christ Church Needham and the Episcopal faith. This fall, a six-session program called “Putting Down Roots” will address beliefs, worship, theology, sacraments, governance and history of the Episcopal church as well as how members of Christ Church live out love of God and neighbor in the world. Taught by Christ Church clergy and lay leaders, the program is open to all: new residents of Needham, people considering joining and people who are already members. Class dates and times will be arranged after we hear from you. If you’re interested, please email the our rector, Rev. Nicholas Morris-Kliment. We hold Adult Forums on selected Sundays after the 10 a.m. service. Most of the book discussions and forums are led by clergy and parishioners, with occasional guest speakers. We invite members to come forward with ideas, including speaking about a topic they would like to share with fellow parishioners. Check the calendar for upcoming forums and events. Advent and Lent present opportunities for renewed learning and reflection. During these seasons, we offer programs geared to help people enter more deeply into their relationship with God. Retreats, daily readings and reflections, and discussion groups are examples of our Lenten and Advent offerings. Our women’s spirituality group gathers periodically throughout the year for friendship, food, conversation, and spiritual enrichment. 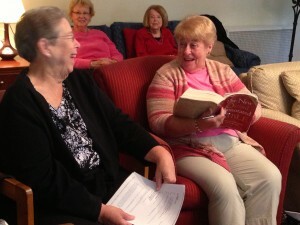 We have enjoyed together brunches, dinners, small group discussions, book groups, and retreats.